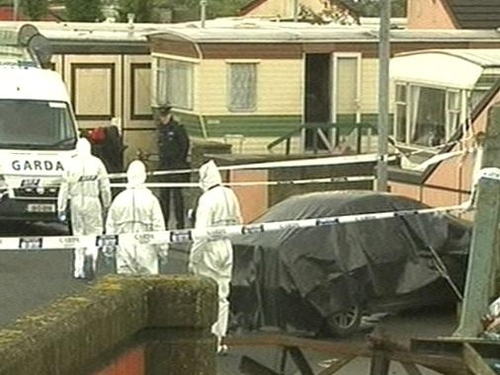 A man's body has been discovered in the boot of a car in Dublin. He has been named as 28-year-old David Sharkey with an address in the Claremont Estate, Navan, Co Meath. Mr Sharkey's body was discovered by gardaí last night in the car which had been found crashed in St Joseph's Park, a halting site just off Dunsink Lane in Finglas. Investigators have launched a murder inquiry. Gardaí confirmed that a post mortem has been concluded but the results will not be released for operational reasons. Detectives said they want to question the driver of the car that was stopped by gardaí on patrol before it was found crashed into a wall at St Joseph's Park in Dunsink Lane. The man is described as being in his late 20s, with short black hair and spoke with a Dublin accent. Gardaí said the silver BMW 3 series car was not stolen. Gardaí would like anyone who was in the St Joseph's Park area of Finglas last night to contact them at Finglas Garda Station on 01-6667500 or on the garda confidential number 1800 666 111. They also appealed for anybody who spotted the car, registration number 04 D 15553, anywhere between Navan and Finglas last night to contact them.